"consists of 184 thousand pieces." Wow! That's huge! ...or a typo that should have been 1.84 thousand...or 1,840. 1184 according to the box! Why are education sets always rather expensive? Because they are more than bricks - they have hours of science poured into these sets and detailed instructions. ALso they are ment to be bought just once. do lego publish the instructions to these sets as well? What a cool set! I wish the quantities weren't so limited. And to think Panama is basically next door to me. 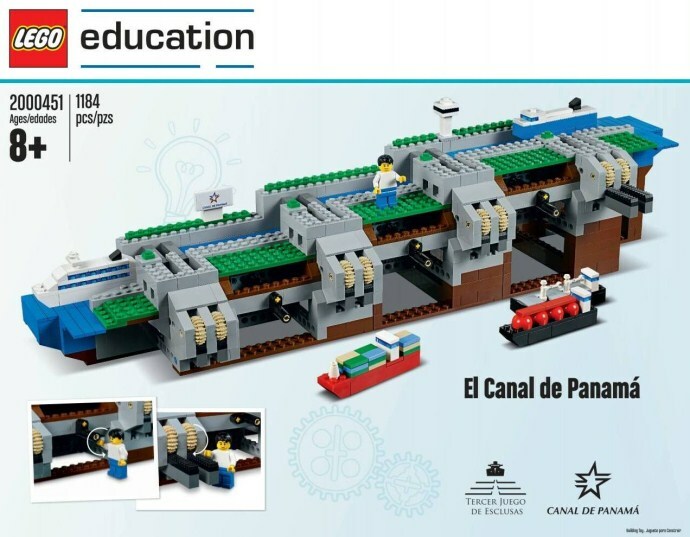 I'd be curious how many schools in Panama would be actually able to afford this, unless it's given out to them and the crazy price is only aimed at "general public" (read: collectors, who are expected to finance this project). Otherwise the price is so silly, I'd dare call it a scam. The Brickset notes state 'Production run said to be just 40,000.'. I agree the price of these educational sets is ridiculous, but the good thing is, this set seems to use pretty easy to source parts, so BL'ing it should be fairly easy and inexpensive. That is of course assuming we get the parts list somehow. Would love to have this, but that price, haha! From the main picture, there appears to only be one set-exclusive piece, and that's a sticker. I have a feeling this could be pieced together for around $100USD. Just wouldn't have the box and instructions. Wait, what makes the set official? Does it have to be built directly from the box? Nice looking set, but it misses the way the water flows from one chamber to the next - critical in the dry season. I can't think of a solution at the moment, but I'm sure it would be possible, using cunningly interlinked rack-and-pinion systems. The title of the set "El Canal de Panama" makes me think it might be limited to distribution in Latin America. Which if that is the case, that is actually rather cool. Latin America is still a new market for Lego on the most part; where they have to compete against Chinese bootleg sets and homebrewed pirated DVD's of their own "Lego Movie" and PS2 games such as "Lego: Star Wars." There is definitely a demand for Lego in South America, but the lack of available products and the proliferation of counterfeits means Lego is still new to the market. Wow, that price! I was hoping it might have been in a different currency so that it wouldn't hurt so bad in US. Still, this looks like it would be a lot of fun to take into my son's Kindergarten class. Very cool set, I hope building instructions become available. I'd love to get my hands on this set, fun and educational! The price is unfortunate however, and I've never understood why the education sets are so much more for price/piece. I wonder if the water level raises and lowers in the model, as it should. Finally one of many things that represent my country! The Panama Canal! I'd go all out to get this set. Those micro ships are fantastic. Transiting the Panama Canal in a ship is on my bucket list. @FlagsNZ--I think going through the Panama Canal is on my bucket list as well, and this set of locks is excellent. I do hope the instructions become available! It's a set I'd love to Bricklink, but I don't think I could reverse engineer it just from the pictures. @xboxtravis7992 Well the general public in South and Central America can't afford this is set. it is not really ment as a set to boost direct sales from the general public. It is more a set ment to make children and Teenager aware of what Lego can do. Hopefully this set will be given to many schools in Panama/Central America since few schools can afford this set.